You may be wondering how recycling and dishcloths go together? Well I had received this pretty green glass jar with a flower arrangement in it recently. It is a lovely jar and I thought it would be a nice item to recycle and decorate for an upcoming charity fundraiser. 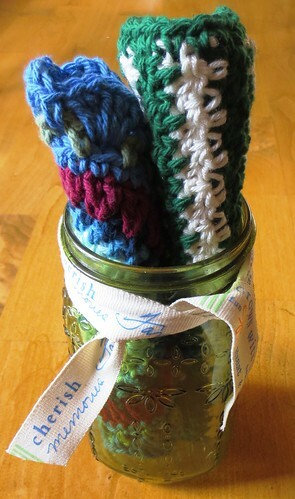 So I rolled up a few crocheted dishcloths and placed them in the jar and I added an inspirational ribbon as an embellishment around the top. Here is the finished project which I call a recycled jar of cloths.